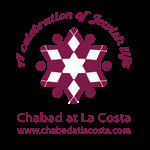 We would like to thank you in advance for your support of Chabad at La Costa . It is people like you who make it possible for us to offer educational programs and community outreach services! Thank you again and G-d bless. Chabad at La Costa is a 501(c)3 nonprofit organization. All charitable contributions are tax-deductible. You will receive a tax reciept by email. Please be sure to select correct credit card type.